I admit to having had mixed feelings when I first heard about this Michael Crichton manuscript that had been found and was soon to be published. 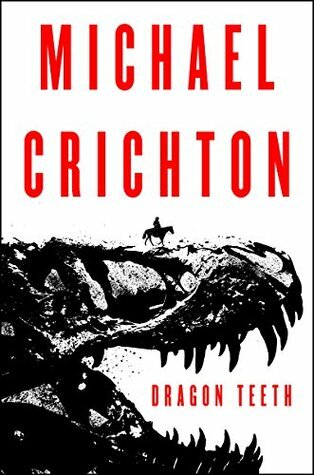 I am normally a huge Crichton fan, but I was so terribly disappointed by Micro, that I didn’t want to get my hopes up and nearly decided to give this one a pass. Fear of missing out on something more like vintage Michael Crichton won out in the end though, and I’m glad it did. Do not let the giant dinosaur head on the cover fool you. This is not a prequel to, or in any way related to, Jurassic Park. I have to mention this because I have read a few complaints in other reviews from people who believed that was what they were getting when they picked up the book. Dragon Teeth can best be described as Western Paleontological Historical Fiction. And if that wasn’t already an existing genre, it is now. After a losing a bet, young Bill Johnson joins an expedition headed to the wild west in search of dinosaur bones. The story follows Johnson as he leaves his comfortable city life and heads into the unknown with a group of relative strangers. While focusing on the real-life rivalry of paleontologists Othniel Charles Marsh and Edwin Drinker Cope, Dragon Teeth is a well-researched tale of armies and Indians, treaties and wars, gunfights and survival, and more than anything, of one 18 year old boy’s journey to manhood. If you are a fan of Michael Crichton’s older novels, like the Great Train Robbery, then don’t miss this one. THANK YOU! What I’d call “classic Crichton” is some of my favorite fiction, but everything from Prey onward (plus Timeline, which I thought was just silly) has fallen short, so I wasn’t going to rush out and read this. Besides, “found” manuscripts from famous authors are usually disappointing. But I was curious, and now I’ll definitely give it a try! I hope you enjoy it Janey! It’s just good old fashioned story telling.